A text reminiscent of The Giver. Another great book to add to the current cannon of dystopian literature. It deserves a spot right along side The Hunger Games and Divergent. This book is one I will personally recommend to large numbers of my students because so many of them have dystopian fever. 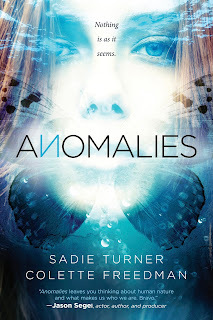 Anomalies would fit in perfectly with literature circles or book clubs focused on science fiction or dystopian literature. The combination of of biblical allusions and science fiction make this novel a new twist on a genre that has been published a lot in recent years. There are many passages that I will be pulling to use as examples of allusion in my English classes. One that comes to mind is, "Their job is to insert a small crystallized dot, called a Third, containing data...between the baby's tiny eyebrows." This is very much reminiscent of The Mark of the Beast from the book of Revelations.